Denver, Colorado. November 20, 2013. The Center for the Advancement of Science in Space (CASIS), the nonprofit organization promoting and managing research onboard the International Space Station (ISS) U.S. National Laboratory, in association with Wings Over the Rockies Air & Space Museum, unveiled an exhibit dedicated to the ISS at the “Spreading Wings” gala featuring former NASA astronaut Buzz Aldrin and renowned astrophysicist Dr. Neil deGrasse Tyson in Denver, CO over the weekend. The exhibit, which is sponsored by CASIS, focuses on the capabilities of our nation’s only microgravity laboratory and the historical achievements associated with space exploration. 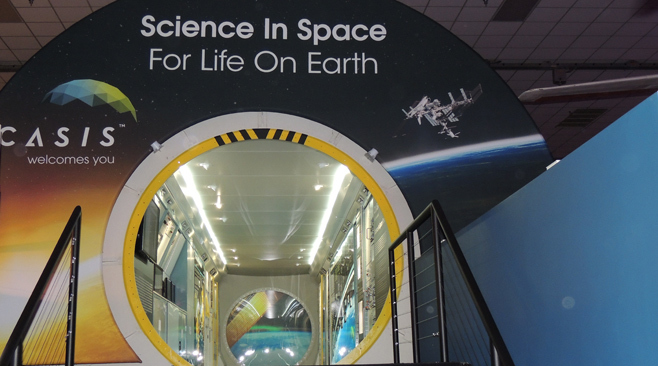 The exhibit highlights the CASIS mission and features research that has taken place on the ISS along with ideas and plans for future activities onboard the National Lab. Wings Over the Rockies Air & Space Museum is dedicated to educating and inspiring people of all ages about aviation and space endeavors of the past, present and future. In its effort to promote the benefits and opportunities onboard the ISS National Laboratory, CASIS seized the opportunity to partner with a like-minded organization capable of reaching new audiences in a region rich with aerospace tradition.